As human beings, we are hardwired to experience Ecstasy, Epiphany, Laughter and Bliss. Little children twirling in the summer sun to experience the altered state of becoming falling-down-dizzy are not very far removed from whirling dervishes seeking spiritual attunement with the harmonious spin of the planet. If the pull upward into ecstasy is mighty, human frailties dictate that the ascent will be an imperfect one, with use sometimes leading to the hell of abuse. 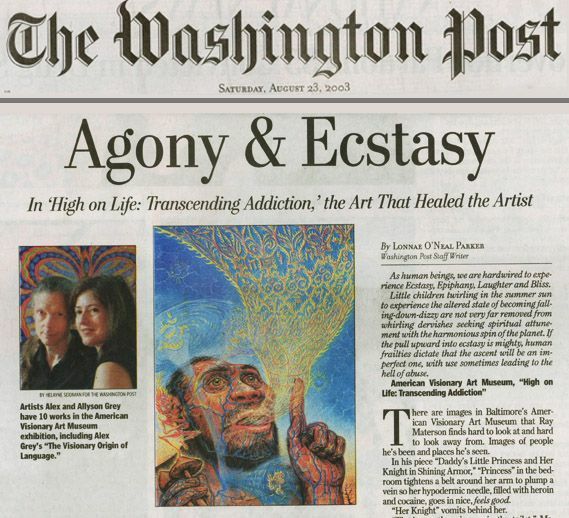 American Visionary Art Museum, "High on Life: Transcending Addiction"
The exhibition "High on Life: Transcending Addiction" is in its final week after 65,000 visitors -- school groups and drug treatment providers, addicts in recovery and outsider art fans, Maryland's first lady, Kendel Ehrlich. Most of the artists are self-taught; they are addicts, unapologetic users or victims. It is an exhibition about altered states, and the things we use to take us there -- coffee, cigarettes, cocaine, LSD. It is hellish and it is heavenish. It is about journeys and trips. And it is filled with wonder. Alex Grey was a depressed teenager who in college did performance art obsessed with death and decay. He and his wife of 27 years, Allyson, found each other tripping on LSD at a party. Tripping brought them closer to God, they say, and their paintings render that journey. "When a person's life experience is too big for words, it comes out as art," says Rebecca Hoffberger, AVAM's founder and director. And art gives salvation. In "High on Life," 300 works by 100 people show that the search for meaning exists along a wide continuum of the human experience. But it is the lives of the individuals that show it most profoundly. Shamanic use of plant-based hallucinogens -- including cannabis, mushrooms, peyote, and ayahuasca -- was central to the religious lives of people in parts of African, China, India, Tibet, Siberia, Mediterranean Europe, and the Americas. To the shaman with expertise in their use, the experience that rational science interprets as hallucination is an interdimensional interaction with super-natural beings and visible, sometimes audible energy forms -- in other words, nothing short of a direct encounter with God or gods. 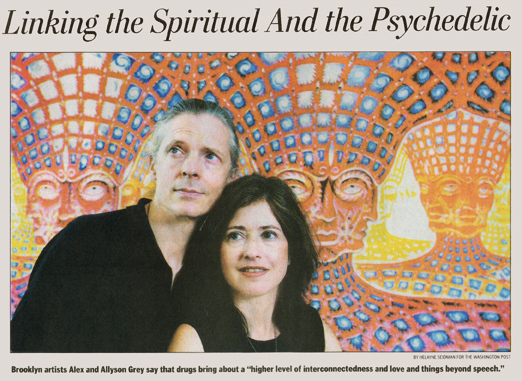 Alex Grey, 49, and Allyson Rymland Grey, 49, are sitting in the Brooklyn loft they share with their 14-year-old daughter, Zena Lotus, talking about the hallucinogenic drug LSD. "It's probably foolhardy to speak with you about it," Alex tells a reporter. But "it would be such a shame to only talk about addiction and not talk about transcending," says his wife, which is what the Greys say using LSD helps them to do: see the light of God. Alex, who was raised in Columbus, Ohio, says he was haunted by nightmares and began drawing pictures of skeletons at 5. He continued to make pictures of dead things. When he was 9, JFK was assassinated, and he also watched his grandmother turn yellow with jaundice and die. He painted a vivid Grim Reaper. In the 1960s, when the drug was still legal, he did a junior high report on LSD. "They talked about a drug that would open the imagination and give you access to visions of another world. I was fascinated," he says. But when classmates tried it, he passed. "I was pretty depressed as a teenager," he says. "I thought it would make it worse." He grew consumed with the questions of imminent adulthood, "with wondering: Is there a God? Is there only a material world? Are we only supposed to make money and croak?" For two years he studied at Columbus College of Art and Design and immersed himself in polarities: good and evil, light and dark. He pondered dead and decaying things. He dropped out and got a job painting billboards. He shaved off half his hair for half a year, and he went to the North Pole to "feel the polarities" of the Earth's magnetic fields. In 1976, he went back to school for a year at Boston's Museum School. That's where he met Allyson, a Baltimore native. He says he was out with an art school professor when she invited them both to her house for a party. The professor came to pick up Alex and had a bottle of Kahlua and LSD. "I had just come back from the North Pole and I thought, what the hell, I can do anything." He drank half the bottle, Allyson drank the rest. They talk about that trip as the one that changed things. Allowed them to know they were supposed to be together. Allowed Alex to see. "It was a brilliant living light. It was a light you wanted to go toward. It was like the light of God. Prior to this, I had struggled with the whole idea of God. I did not believe there was such a thing." The couple moved in together. He took a job preparing cadavers for the anatomy department of Harvard Medical School and she continued in art school. Later he became a medical illustrator, then devoted himself full time to his art. They continued to trip together. Allyson, who had taken LSD recreationally, says she began to feel a spiritual component in her trips with Alex. "I was raised in the Jewish faith, I went to temple and Sunday school and [observed] all the holidays. But this was the first time I had the experience of God." Between them, the Greys have 10 paintings in "High on Life." They are grouped with yarn paintings from the Huichols, a people indigenous to Mexico who use the psychedelic cactus peyote in religious rituals. 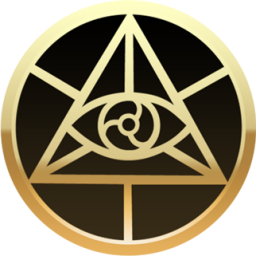 Their works attempt to render the knowledge they say "entheogens" have brought them. Drugs bring them visions of a "higher level of interconnectedness and love and things beyond speech," says Alex. "The Bible is filled with messages from the visionary world," he says. He cites Christians writing of angels. "Ezekiel saw the wheel. Moses saw the Burning Bush." They say their daughter, an actress who had substantial roles in the movies " Snow Day" and "Max Keeble's Big Move," doesn't do drugs. They are prepared for her to one day make a different choice. They hope it is an enlightened one. The Greys speak out against a society that makes marijuana and crack similarly illegal. They teach workshops on visionary art and attend conferences on links between spirituality and psychedelic drugs around the world. This fall they hope to open a chapel of Sacred Mirrors in Manhattan and fill it with Alex's paintings. "I'm trying to create a portal into the mystical dimension of reality," he says.